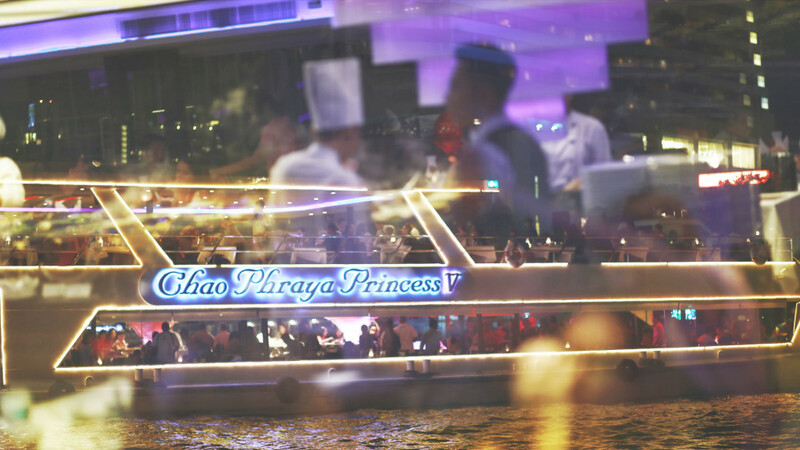 How to choose Thailand’s best dinner cruise along Chao Praya river? A dinner cruise, also known as a floating restaurant, along the Chao Praya river allows restaurant owners to distinguish themselves from their competitors. Establishing your own restaurant is not an easy feat. Aside from the need to have mouthwatering menus that will lure the customers in, the service has to be fast, courteous, friendly and cater to all the needs of the customers. Last but not least, the most important criteria that one should not miss for favourable outcomes is the location. Needless to say, a good location would already mean a step ahead of your competitors. The answer to finding the best location is to have a cruise that stations at the busiest, and most beautiful water body in Thailand. It sails the Chao Praya river, taking you away from the hustle and bustle of the city, and allows you to immerse yourself with the dazzling scenery from both sides of the river banks. Historic landmarks such as temples greet you from all directions, as you sail along the river. This dinner on cruise allows you to enjoy Thai traditional cuisine while mesmerized by the breathtaking view of Bangkok at night, and her the staffs’ renown hospitality. Things to look out for, for the best experience! Let’s take a look at what a good cruise should have. The following checklist allows you to keep intact of the things required for your romantic dinner on cruise. To start with, a good cruise, without a doubt, should have a well-designed structure, to improve the stability of the ship and prevent the ship from rocking. A well-organized piping and electrical system are also crucial on board. In case of an emergency, equipments and rescue devices will be dispatched immediately to assist every individuals. You can rest assure as your safety is always our first priority. In order to remain competitive in today’s market, many restaurant owners turn to the latest trend of dinner on cruise. It is used as a mean to garner new and more customer of all ages. Although there are more alternatives available, however, impeccable service is what makes one stand-out from the crowd. Be sure to compare the prices for the dinner-on-cruise between different companies, and choose a suitable choice for yourself. Moreover, the menus have to be appetizing and outstanding, as well as meeting the food hygiene standard in order to leave an impressive experience for the customers. Social media has made its way into our daily lives. Reviews become one of the most important factor generations of the 21st century look at upon making decisions. These reviews are accessible on platforms like Facebook, Pantip, and YouTube, they range from first-hand experiences to stories one heard. Reviews are there to facilitate individuals in making decisions between options. Chao Praya Princess made it to the top list from all social media platforms. Best known for her luxurious design, also superior services, consequently, she quickly became one of the best dinner-on-cruise in Thailand. Join us for dinner, and get a glimpse of the beauty of Bangkok at night. For those who would like to try out different atmosphere, a new ambience, the dinner cruise is perfect for you. Having dinner under the moonlight could be an excellent idea to bring your special someone out on a date. Partying with friends, or having dinner with family are possible on one of these dinner cruises as well. Rest assure that these cruises, for instance, Chao Praya Princess which is designed and built by MitsDecisions Shipyard, guarantees the safety and convenience to all customers with its premium standards. With this, you can take pleasure in a romantic candle-lit dinner experience that will definitely be a lasting memory for you and your companion. We hope that this checklist will be of great help to you and enjoy your trip! Recommendations from professionals could be the answer to the questions you have, or you can contact us directly.